You enter a space alone, but you are not alone. You hear breathing. In this one-to-one experience Ziggy explores the physical communication of horses through breath and body. A spacious, intimate and moving experience for our time. This experience is part of Two Legged Animal Trilogy and is a short intimate experience for one audience member at a time. Created with support from Circus City, The Island and Ausform. 23rd and 24th of October Daytime between 10am and 5pm. Tickets: £3 Email tickets@bristolcircuscity.com to find out about available slots and book yourself in. You can also see Encounter as part of the Trilogy Ticket £20/18 email for details. Once you have reserved a ticket via the ticket email you will be sent instructions of where to meet and be taken to the space. 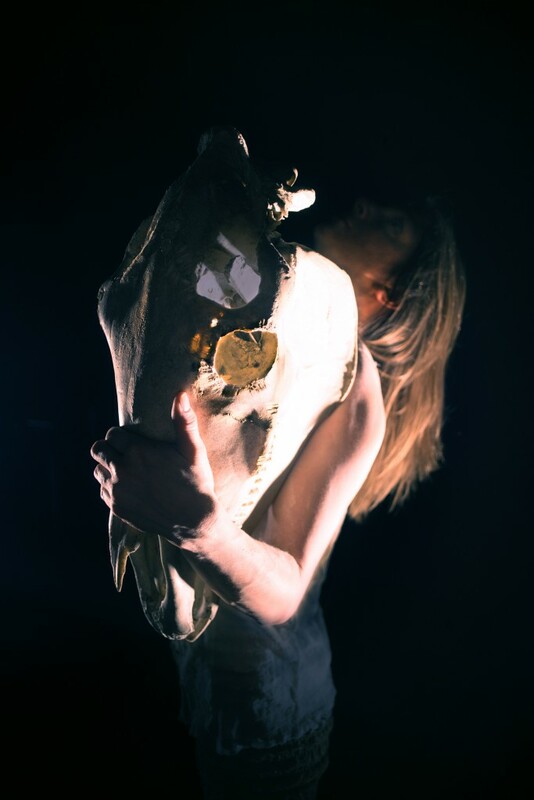 A sleeping woman holding the skull of a horse takes us on a journey through her dreams: slipping between worlds, lives, places and time, headlong galloping towards a dramatic climax. The timeless relationship between human and horse, women and the wild. Strong, fragile, beautiful and feral, Two Legged Animal calls to the heart in all of us that cannot be tamed. You are looking at the listing for the Raw part of the Two Legged Animal Trilogy. A raw, stripped back performance, mixing installation and physical performance. The show is part improvised, allowing connection with the atmosphere of the moment, the space and the people within. You can also see RAW as part of the Trilogy Ticket £20/18 email for details. A woman rises to her feet clutching the skull of a horse, and circling to the tune of a fiddle player. The timeless relationship between human and horse, women and the wild. Strong, fragile, beautiful and feral. In this debut solo show, which previewed in February 2015, Ziggy brings her special combination of expressive performance and circus skill to the fearless voice and music of Rowan Rheingans. Together they slip between worlds and lives, part woman, part horse, part circus, part magic. A mesmerising journey across an open landscape and in to the night. Two Legged Animal calls to the heart in all of us that cannot be tamed. You are looking at the listing for the Original show part of the Two Legged Animal Trilogy. A visually stunning show, a sparse poetic set brought to life with stunning costumes designed by Helena Andersson. The trilogy also includes a short intimate experience for one audience member at a time at a The Island on the 23rd and 24th Oct), and a newly created raw stripped-back experience of the original performed in the intimate setting of All Hallows Hall (22nd October 7.30pm). See one, or experience them all. "Intense, mesmerising, magical, powerful, feminine, strong, beautiful, immersive, important & outstanding"
"Never seen anything like it before"
Created with support from Jackson’s Lane, DOCH, Ausform, VOLT, Circomedia, Wild Goose Space and with funds from Arts Council England. Two Legged Animal by Ziggy - Teaser from Circus City on Vimeo.